Attorney Joseph McClelland, helps clients fight for their consumer rights against big corporations. We focus our energy on helping consumers fight inaccurate credit reporting that causes damages to their lives. 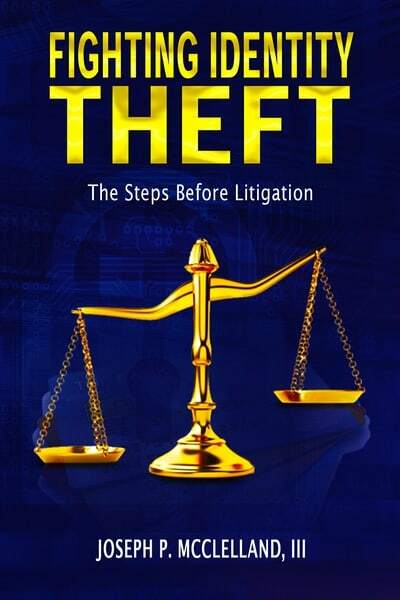 Get an identity theft lawyer to help make them follow the rules and do what's right. Make the businesses and credit bureaus correct their errors. Any attorney's fees we get are paid directly to us if you win, so you don't have to. We make sure that injured clients get what they are entitled to under Georgia law. Hire us as your Atlanta motorcycle accident attorney, Atlanta truck accident attorney , Atlanta personal injury attorney, Atlanta car accident attorney and more. Obtain fair settlements for the injured. Present your case honestly to the jury for them to make a great decision when the insurance company is not being fair. Atlanta divorce attorney - uncontested divorce in Georgia. ​​​​Get a Copy of Our New Book: Coming Soon! Learn everything you need to get identity theft accounts removed.